The wonderful One Skein Wonders Series has a new book: One-Skein Wonders for Babies by Judith Durant. The book is chock-full of beautiful patterns for babies, each using just one skein of yarn (no surprise!). Included are patterns for booties, hats, blankets, clothing, and even toys. My contribution is a cute little bib, Tutti Frutti, done out of Classic EliteYarns Seedling. This is perfect yarn for a bib; it is an environmentally conscious, machine washable organic cotton with wonderful texture and softness. Seedling is a great choice because it's absorbent and retains its color intensity well. I chose to use a hand paint for visual interest and added pockets to catch any runaway bits of food. 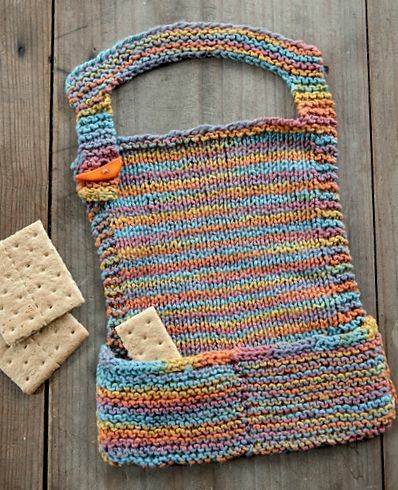 The bib is a quick and easy knit that would make a great gift for that special baby. Have fun choosing a silly button! I was very excited to start knitting when my copy arrived; I hope you will be too. Please support your LYS and shop for the book there first. It has begun to be chilly enough in the Northeast to throw a lightweight cardigan on at night while I curl up in a favorite chair to knit. This means that changing leaves and cooler temps are just around the corner. In keeping with this time of year, the magazines are releasing a new crop of patterns to take us from Fall into early Winter. These fresh new ideas from designers are now ripe for the picking. The 'Zigzag Wanderer' is a timeless knit worked up in neutral shades of organic Mohawk Wool. A slightly oversized shape gives the pullover a modern appeal while also making it a comfortable wardrobe staple. 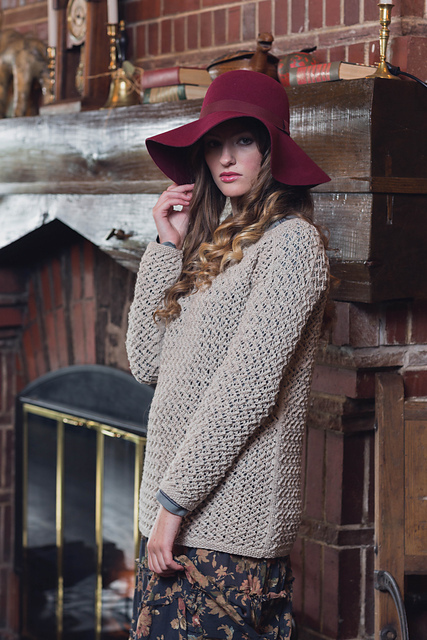 Designed by Laura Grutzeck, this pattern is found in the Fall 2015 issue of Interweave Knits. Knitscene's new Fall issue showcases Liberty Wool Light in the 'Brigitte Headband'. Designer Avril Lang was inspired by Brigitte Bardot. It will take you one skein each of two contrasting colors to work up the garter stitch chevron stitch pattern and have this wide headband ready before the weather that calls for keeping your ears warm has arrived. Front and center on the cover of this year's Interweave Knits Gifts is bulky weight Wynter in Erica Schlueter's 'Sampler Stole'. The combination of different stitches making up this shawl keeps things interesting. It also really allows this soft alpaca and wool yarn to shine. It comes in colors ranging from dusty teal to crimson, so coordinating it with your winter coat will be easy. With eight natural undyed shades of Vista to choose from, the color combinations for Patty Lyon's 'Houndstooth Cardigan' keep multiplying. 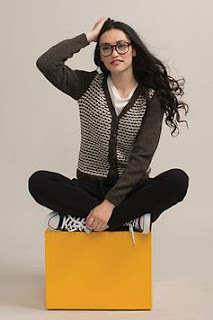 Classic shaping and traditional houndstooth give this cardigan staying power. Yet in neutral tones and with such clean lines, it leaves plenty of room for your own style to shine through. We love seeing what our yarns turn into when magazine editors allow talented designers like these to add their ideas to the mix. Don't you?